Once per turn: You can pay 500 LP; during your Main Phase this turn, you can Normal Summon 1 “Vampire” monster, in addition to your Normal Summon/Set. (You can only gain this effect once per turn.) Each time your “Vampire” monster inflicts battle damage to your opponent: Gain the same amont of LP. Love the name, love the artwork, and love the effects. Vampire’s Domain is a Continuous Spell Card that gives you one extra Normal Summon or Set of a Vampire monster at the cost of 500 Life Points. You can also gain Life Points every time your Vampire monsters inflict battle damage. It would be funny to see a monster run into a Def position Vampire of yours and gain you Life Points. It’s searchable, but not a Field Spell which is a little weird. Otherwise Vampire’s Domain is balanced and worthy of maybe 1 or 2 in the deck. We now look at one of the new Continuous spells for the Vampire archetype, Vampire’s Domain. Once per turn, you can pay 500 LP to be able to Normal Summon a Vampire monster in addition to your Normal Summon or Set. Any way to get extra Normal Summons is very nice, and this can help get your Level 5s and 6s out with greater ease, bonus if you can get a good monster like a Mezuki something to tribute, or have Vampire Sorcerer in the GY. Each time a Vampire monster deals damage to the opponent, you can gain that amount of LP in return. Nice way to replenish the LP you are likely paying in the Vampire deck, since most to all the monsters have some sort of LP cost for an effect. Plus, gaining LP is always nice. Vampire’s Domain is a solid card in the deck, and it being searchable means you don’t have to play as many so you don’t have to worry about multiples clogging the hand. I’d say 1 to 2 is good. Art: 5/5 The red moon sells me on the artwork, so sick! Vampire’s Domain (this kind of feels like it should be a Field Magic to me, but whatever) is a card I REALLY like. It grants you an Extra Normal Summon of a Vampire Monster at the cost of 500 Lifepoints during your Main Phase. The cost is very reasonable, it helps add some swarm to the Deck (something Vampire’s should be able to do), and the extra Summon being Normal won’t get stopped by all the negation of Special Summons we play. Secondly, each time your Vampire Monsters inflict Damage to your opponent’s Lifepoints, your Lifepoints increase by that amount. 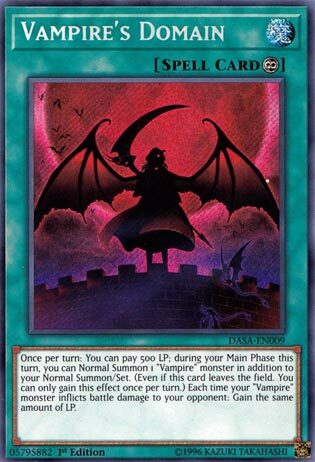 I know overall people aren’t generally a fan of Life Gain in Yugioh, and this is a new concept for Vampires. But it makes sense that Vampires would be able to do such a thing, if only according to lore. I want to see a Vampire/Fire Princess burn/recovery Deck. It’d be an interesting hybrid I think.